This entry was posted in Competitions, Programming. Bookmark the permalink. I am exactly the same way... My average WPM is 113. 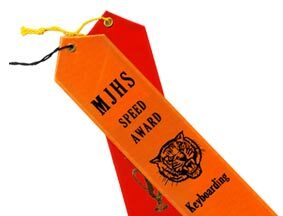 (On my macbook I can only type at about 98 average) But I don't type in the way that you are supposed to. I actually use the caps lock instead of the shift key when wanting to capitalize a letter. Whenever I try using shift its just so awkward. I usually always have my pinky in the middle of capslock and shift so its easy to quickly turn on/off capslock. My left hand is usually all over the left side of the keyboard. I use all of my left fingers for typing on the left side. But then, when we get to my right hand... my middle finger and ring finger don't do any work. Rarely I'll use them but it would be by accident. I use my right index finger for all the typing of letters. I use my pinky for deleting things, and both of my thumbs for spacebar. Usually it is my left thumb, though. But it just depends on which is closer to the spacebar. I was always yelled at by my typing teacher because of my unorthodox way of typing. I succeed all of my peermates, though. Their WPM being 20-40, mine being 100+. I too type incorrectly, I use a method where my LEFT thumb, and RIGHT index finger hit the shift bar and pinkies hit the shifts. The index fingers and middle fingers cover everything else. I casually type around 80-90 words per minute with the keyboard on my lap and when testing with good keyboard on a solid desk, proably 100-130 words per minute. I'd say my best typing attribute is the ability to instantly backspace an error the millisecond I type it.. other than that, I wish there were some keyboard out there or some layout to make it even easier and faster.. but I think this is about as far as we go with out current technology.